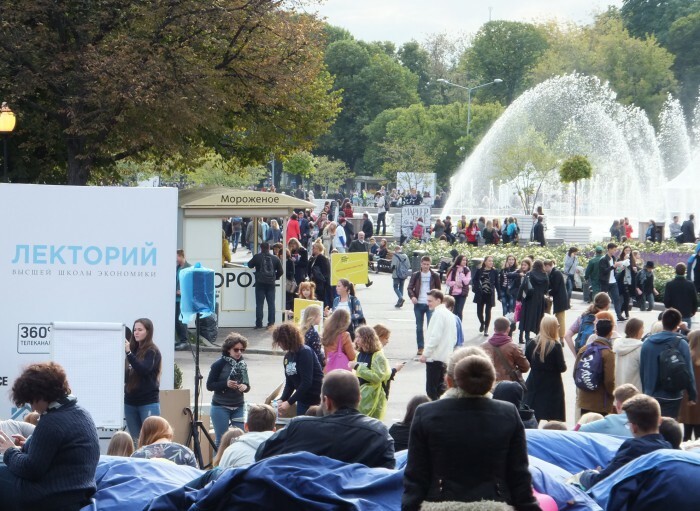 This is part 3/3 of my talk that I delivered a HSE Open Day 2015 in Gorky Park in Moscow. You might think: Fair enough. There are so many examples of best practices out there, but why not in my home town? Why do I have to wait hours and hours to file a form? Why are bureaucrats still impolite? A lack of innovative behavior in some administrations is due to the lack of competition in the public sector as a whole. Performance is not linked to the survival of units; public organizations have the property of “semi-immortality” (Choi and Chandler 2015 Lead & Gov, p. 144). Max Weber, a famous researcher from Germany, and researchers from the progressive era in the US, wrote about how public administration should look like (normative approach). Others including Barnard (1938), Simon’s classic ‘Administrative Behavior’ from 1947, and March and Simon’s ‘Organizations’ from 1958, asked “what motivates bureaucrats to behave as they do?”. This was the “behavioral revolution in the study of organizations” (Kenneth J. Meier and George A. Krause. 2005. The Scientific Study of Bureaucracy: An Overview. George A. Krause and Kenneth J. Meier (eds). Politics, Policy, and Organizations: Frontiers in the Scientific Study of Bureaucracy. University of Michigan Press, 1-19. P. 3). If we think of public administrations as utility maximizers, which I think makes sense, it is rational for them to maximize budgets, reputation, and hopefully also the public interest. In any case, maximizing the public interest will not be their only goal. Reason one. Some elected officials do not adopt a new practice because they intend to protect their managerial autonomy. Two strategies are available for public organizations, the first one being to innovate and to identify new opportunities; and the second one being to use existing knowledge. There is a strategy of exploration of new knowledge and a strategy of exploitation of existing knowledge. Innovative organizations may witness a failure trap and a success trap. Failure trap means that reform and change occurs to frequently in public bureaucracies. Decision makers do not wait until a prior reform has been implemented and works. They start something new because they don’t see any benefits from recent reforms; they have lost sight of the fact that the potential benefits are long term. Reason two. Two questions arise from what I said so far: How to spread innovation in Public Administration? And what does that mean for Moscow, the City we are living in? First, how to spread innovation beyond frontrunners and change agents? One idea might be a patent system for the public sector. There is a gap between taking the risk to innovate and realizing the benefits from them, because new ideas, programs or processes, i.e. innovations, are considered as public value (Choi and Chandler 2015 Lead & Gov, p. 142). In contrast to the private sector there is no patent system that secures the claims of an innovative individual. How can we make that a best-practice becomes the industry-standard in the sector? Which is similar to the question: How to facilitate knowledge-transfer and information spillover? I consider two basic approaches: The first one is the Chinese approach. China has a long tradition of policy-experiments in its provinces, the equivalent to the Russian Regions. A pilot is tested in a number of municipalities or provinces. If it works it is spread all over the country and implemented in other administrations. This is a centralized approach to knowledge transfer. (Charlotte Lee and Xiaobin He. Development and Change 42(2) 329-352. Heilmann 2008. The China Journal 59.). This might work. Accidents on the job are common in China. Not because there is a lack of regulation, but because of corruption. But recently central government has adjusted the performance indicators that are used to assess whether a bureaucrat will be promoted. Now, the number of accidents at work in a given jurisdictions contributes to performance assessment. Guess what happened: The number of industrial accidents sharply decreased. On the other hand there is a fiscal federalism approach. The approach is based on the notion that voters are (i) mobile and (ii) sensitive to performance differentials. Both approaches claim to contribute to improvement of public service delivery. But they reflect two views of the world. This can be seen from the following quotation from a former Chief Executive of a large English Local authority from an interview that I conducted in 2013: (This and much more quotations from a set of some 50 interviews can be found in a forthcoming book, Tim Jäkel: Benchmarking in der öffentlichen Verwaltung: Ein europäischer Ländervergleich, Speyrer Forschungsberichte. Speyer 2015). So, one question is how ideas develop and spillover to others. But even more interesting is the question how learning and knowledge transfer impact organizational performance. These are some of the questions I am currently doing research on at the HSE School of Public Administration. And these are the things you will probably hear about in one of my classes. What does all that mean for Moscow, the City we are living in? Moscow is large, and (ii-iii) for sure has a large body of skilled professionals. And a lot of them have been hired from outside. Sobjanin is the most prominent example. (iv) There are internal performance management structures, though they have to been further developed (see Barabashev 2014). I suggest to give more managerial and fiscal autonomy to the cities boroughs and its districts. This will allow launching policy experiments within defined ranges. The big asset is that City Government is willing to listen to demands from citizens, and to fix reported problems. This is why I am confident that there will be – maybe small – but steady improvement. A last picture shows a recent change that fueled my confidence. There is an old-school but still common timetable for public buses. 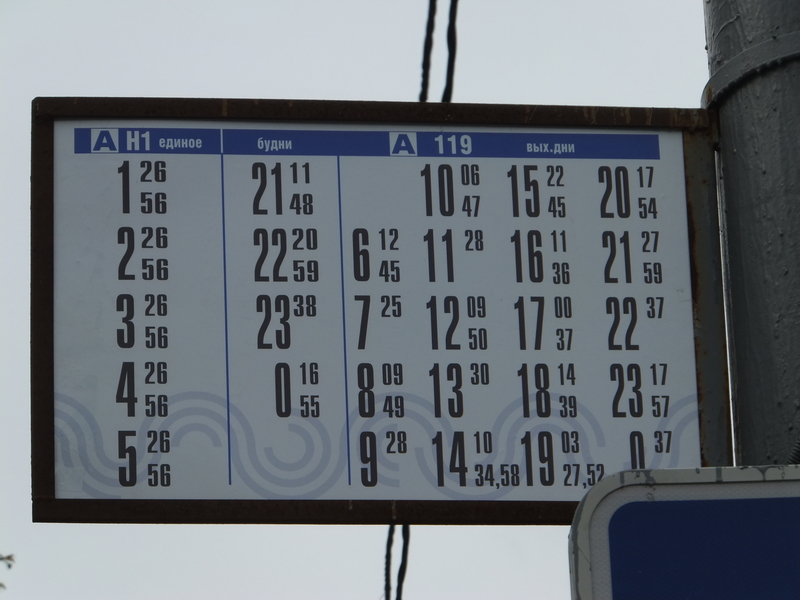 It is odd, because it indicates intervals between single buses. 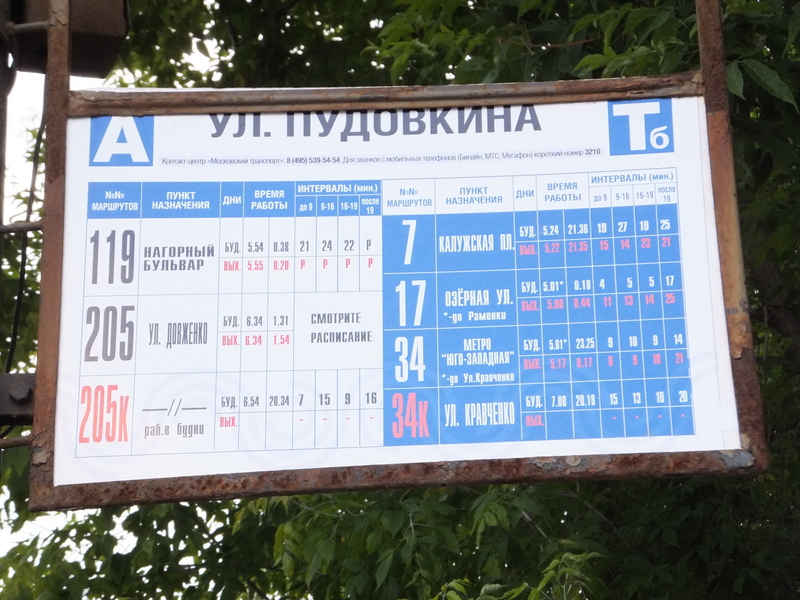 But when the bus will eventually arrive is unpredictable. Now, this looks much better. 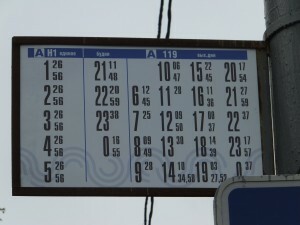 The bus line 119 is expected to arrive at 8.09. Good. People can now monitor whether public transportation is on due time. At the end of the day they can hold bureaucrats to account. On Gorod.Mos.ru.